Deep in the underbelly of Manhattan, the research team peered into an abandoned subway tunnel, their flashlights illuminating trickles of water cascading down the crumbling, stone walls. The scene, displayed on screen during a lecture of Innovation in Science and Engineering: Conference Course (ES 139), was like something out of a blockbuster action movie. These researchers were gathering information to use in developing a video game, explained Tommy Francois, vice president of editorial at UBISoft, the world’s fourth-largest video game company. Guest speaker Francois showed numerous examples of how UBISoft developers go far outside the box when conducting research—from exploring a mountain village in Tibet to studying the lives of remote villagers in the Panamanian jungle. This lecture may seem far removed from the nuts and bolts of science and engineering. But inspiring stories from successful innovators account for much of the appeal of the Harvard John A. Paulson School of Engineering and Applied Sciences ES 139 course, which has experienced booming enrollment that recently surpassed 215 students. What began 15 years ago as a class to bridge the gap between developing technology and making an impact has grown into one of the most popular courses at Harvard, drawing big-name speakers from fields ranging from fashion to virtual reality to green chemistry. "Innovation is as diverse and dynamic as our student body, so it is vital educationally that we make as many inspiring connections as we can," said Paul Bottino, one of the course's principal designers and founder of the Technology and Entrepreneurship Center at Harvard (TECH), which pioneered innovation and entrepreneurship education for undergraduates. The goal of the speaker series—featured in most Tuesday meetings of the class—is to encourage students to think creatively about making an impact, whether that be through entrepreneurship, research, or academics. 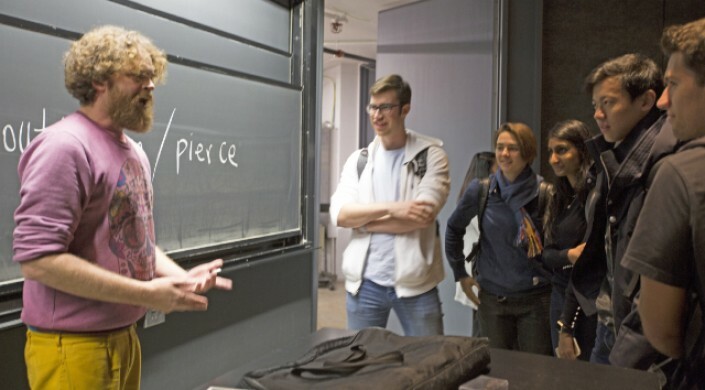 That experience-based, practical advice is a hallmark of ES 139, said instructor David Weitz, Mallinckrodt Professor of Physics and Applied Physics. Boston is a hotbed of entrepreneurship, and the course is designed to prepare students to dive into this booming space. The course is important for Harvard and its students, Weitz said, because it gives them something practical, yet intangible—a creative glimpse of where things are in today’s economy and society. A desire to stand out as an entrepreneur inspired freshman Kami Krista to enroll in ES 139. She said the best feature of the class is the opportunity to meet and work with other aspiring entrepreneurs. Of the guest speakers, Francois was her favorite because of his focus on creative thinking. In addition to the weekly lectures, course meetings also cover theoretical concepts in entrepreneurship and innovation, such as design thinking, business model creation, market dynamics, and financing. The course’s final project challenges students to develop a plan and pitch a technology company to a panel of venture capitalists. Electrical engineering concentrator Allison Tsay, S.B. ’19, and her teammates designed a project to improve and streamline natural disaster relief using swarm robots. More and more Harvard undergraduates are attracted to the notion of disruptive technologies, said Shantell Williams, A.B. ’18, an economics concentrator. Making innovations and entrepreneurship more accessible through a course like ES 139 goes a long way toward fostering a culture of creativity. Moving forward, Weitz and Ricketts are looking to partner with an even more diverse group of A-list speakers next year, and also provide more connections for students to the world of entrepreneurship through TECH and other Harvard programs.